Superb holding capacities. 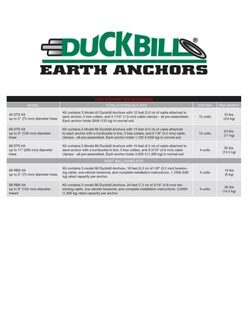 Duckbill anchor systems offer the most effective, lightweight and economical solutions to any anchoring application, large or small. 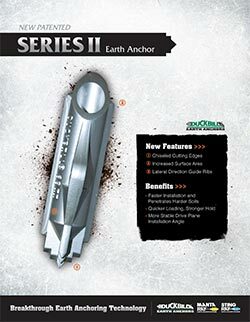 Ancor Loc’s Duckbill anchors, a labour and time saving device, it works like a toggle bolt in soil. Duckbills are driven into the ground, providing a safe and environmentally sensitive installation. An upward pull on the anchor tendon rotates the Duckbill into a perpendicular “anchor lock” position in undisturbed soil. 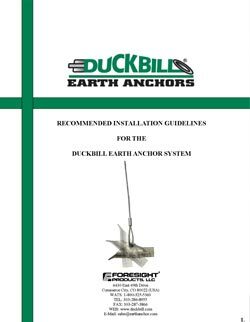 The smallest DUCKBILL anchor, used for light holding capacities is cabled with 1/16 inch (1.6mm) cable. For more aggressive soil, it can be cabled with 1/8 inch (3.2mm) cable. Working load of 1.33kN (136kg). 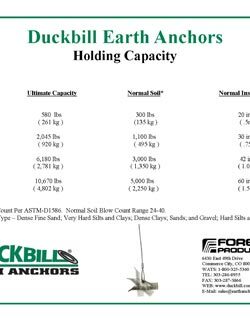 The next smallest DUCKBILL anchor, used for medium holding capacities is cabled with 1/8 inch (3.22mm cable). For more aggressive soil, it can be cabled with 3/16 inch (4.8mm) cable. Working load of 4.89kN (500 kg). The most common of the DUCKBILL anchors, the anchor is cabled with 1/4 inch (6.4mm) cable. 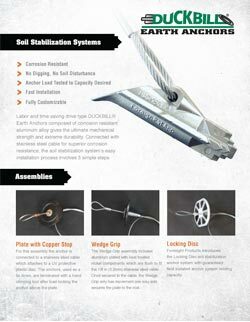 For more aggressive soil, it can be cabled with 5/16 inch (7.9mm) cable. Working load of 13.39kN (1360kg). The largest of the DUCKBILL anchors, the anchor is cabled with a 5/16 inch (7.9mm) cable. This is anchor is installed with a small jackhammer. Working load of 22.24kN (2260kg ).